This is a wonderful and well-designed book on Lebanese cuisine. It has plenty of pictures in both colour and sepia. The recipes have lots of tips for saving time, for storage or final presentation, and the pages are arranged clearly with even the longer recipes being easy to follow. 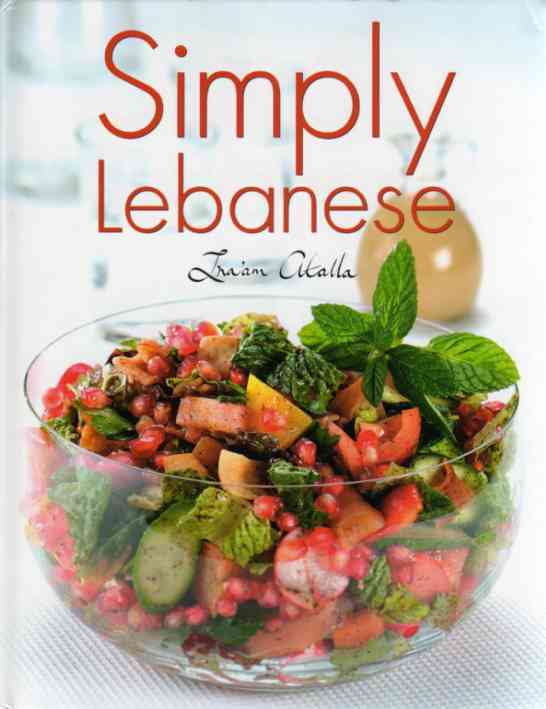 The author, Ina’am Atalla, introduces us to simple Lebanese cooking. She has recreated almost all the dishes by remembering the flavours of the original but has made those dishes accessible to all of us. Ina’am starts us with the basics, with such things as white rice, croutons, garlic sauce and pickles. Turnip Pickles are a reminder of Lebanese food for me: not just the taste but the look of them – delicious and so very pretty. They are the indispensible addition to a Falafel sandwich…also in the book. Kidrah, Rice and Lamb in a Pot is lovely. The ingredients are simple but the finished dish is real comfort. This, as with other recipes, has some background information: Kidrah was originally cooked by nomads and takes its name from the cooking pot. How romantic is that! Orange Semolina Cake is an Ina’am invention and sounds scrumptious. Most of the flour is replaced with semolina and ground nuts. Once again it’s easy but different, and works well with Lebanese food. I’d even make this cake to finish an Indian or Thai meal. My favourite recipe from this book has got to be Deek Roumi which is Ina’am’s version of roast turkey. It has a gorgeous stuffing of ginger, cardamom, cinnamon, dried figs which are a great combination and would add real interest to the ordinary bird. Meat Sambousek are little meat pies and there is a cheese version as well. There are plenty of recipes suitable for vegetarians that are different and flavourful. Chilli Potatoes are seasoned with, yes, chilli but also garlic and coriander. I am not a great lover of Italian pizza but I do enjoy the Lebanese version, Sfeiha. It’s a flat bread topped with minced lamb and spices and a good dose of chilli sauce but, once again, Ina’am provides us with a vegetarian alternative.